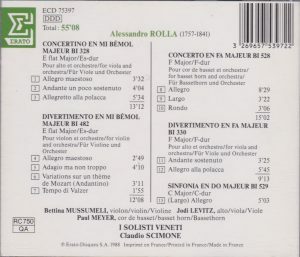 Not being very familiar with composer Alessandro Rolla and his music, it is only after I had started listening to track 1, the Viola Concerto, that I looked at his dates. 1757-1841, almost exactly what I thought: early 19 century, because the piece sounded very much like the viola concerto Paganini could have written. The music is entertaining, but also fluffy and formulaic, very reminiscent in its turns-of-phrases of early 19th century opera – preferably Italian. In fact, when you look at Rolla’s dates, his music sounds both advanced and retarded: 1757, that makes him born a year after Mozart, but because he lived so long, Rolla also outlived Paganini (born 1782) by a year. And indeed, the music gathered here sounds more early 19th century than Mozart – but that’s not necessarily for the better: Rolla’s music is anchored specifically in the Italian early 19th-century, an era and country where composers had simplified to a great extent the vocabulary of the Classical era, and turned it into formulas, the Italy of opera, one churned after the other and in most cases without the unbridled invention of a Rossini, mellifluous but with an orchestra reduced to mere background underpinning, without aiming at the kind of emotional turbulence of German early romanticism that was already in germ in the late works of Mozart. It is significant of Rolla’s roots that the third movement of his Divertimento in E flat major should be Variations on Figaro’s “Voi che sapete”, and it is also very typical of where Rolla stands in the development of music that his “Sinfonia” is NOT a symphony in the classical sense in four movements, not even in three, but a Sinfonia as Vivaldi wrote them, a single movement with slow introduction and Allegro, in the manner of an opera overture. The most genuinely Mozartean work here is possibly the Basset-horn Concerto, but it remains anchored in a galant and charming style that harks back to rococo and doesn’t come close to the emotional depth of Mozart – Spohr’s and Crusell’s respective clarinet concertos may be more appropriate references. Still, since the music sounds so much like Paganini could have composed it, if you look for a possible influence of Paganini on Rolla, it is in fact the other way around: young Paganini, aged 13, impressed by Rolla’s reputation, went to Parma to learn with him. Therefore, it would be more legitimate to call Paganini’s concertos “music Rolla could have composed”. Even young Verdi approached Rolla in 1833 (he was 20) and, yes, certainly, that is where Verdi’s roots are, although he moved far beyond. Rolla’s output was gigantic, concentrating mainly on the two instruments at which he was a master, the violin and the viola (21 violin concerti, 15 for viola). So far as it can be ascertained, the works presented here date from Rolla’s 19th century. The liner notes claim that, stylistically, Rolla began “writing music… basically classic” but “later, as soon as the early nineteenth century, this style evolved into a technique that was pre-Paganini, with pre-Romantic inspiration (…), resulting in a typically Italian, singing melody that was very close to Rossini” . The last part may be an exaggeration – Rossini’s genius is precisely that he exploded those formulas, but otherwise that is indeed what I hear. It provides an hour of charming if superficial entertainment, but no deeper impression. Scimone and his I Solisti Veneti ensemble had a function and importance in the 1970s, for bringing a lighter and more passionate touch to the interpretation of Vivaldi and other Italian baroque composers. But it’s the fate of the avant-garde of yesterday to become the arrière-garde of tomorrow, and heard now, with everything that has happened since, his Vivaldi interpretations sound way too sentimental and thick. 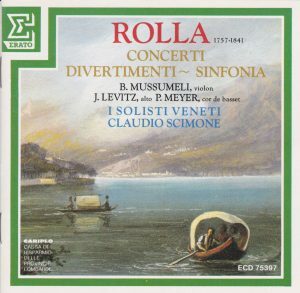 I haven’t been bothered by that in this Rolla program – maybe for lack of comparison, or maybe because Scimone’s interpretive style is ideally suited to that kind of music, early 19th-century Italian opera. It probably speaks a ton about Rolla’s posthumous success that, so far as I could establish, this early Erato release was never reissued. I haven’t even found a Japanese edition, even searching online with Japanese characters: アレッサンドロ・ロッラ クラウディオ・シモーネ.